My Mom often tells me that I am an old soul trapped in a young body. Ever since a kid, I was attracted to people and objects of past. Such inclination sticks to me until to-date, and entrenches in many aspects of my life: family value, friendships, work ethics, and even now home decor. I would like to think I learnt all these values, though old-fashioned, from my Mom. So I started to look for alternatives and came across this similar style by John Richard Collection at Hochow for $2,350! ﻿That's obviously not going to fly so I went back to do some more searching for the Uttermost one. I wasn't holding my breath when I called Lighting Palace in Concord, but then to my great surprise, the owner Motti said that they used to carry it and he could order it in!!! ﻿Today I went in, paid a small deposit, and ordered the Uttermost mirror. I can't believe after a few weeks' search and on the verge of giving up I am about to get exactly what I want, and at a fantastic price! Let's hope Lighting Palace could live up to their words and the mirror gets into Canada without delay. 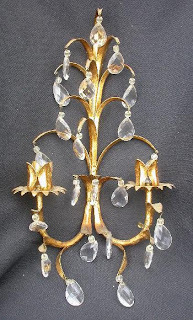 Then back to the old soul topic: we went to an antique auction and I purchased a pair of this Florentine Gilt Candle Sconces that were made in 1890's. 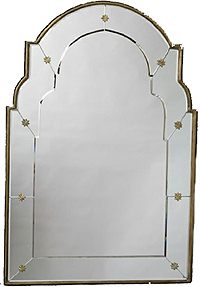 I hope the simple lines from the mirror will pair nicely with them, and overall they don't appear too ornate.